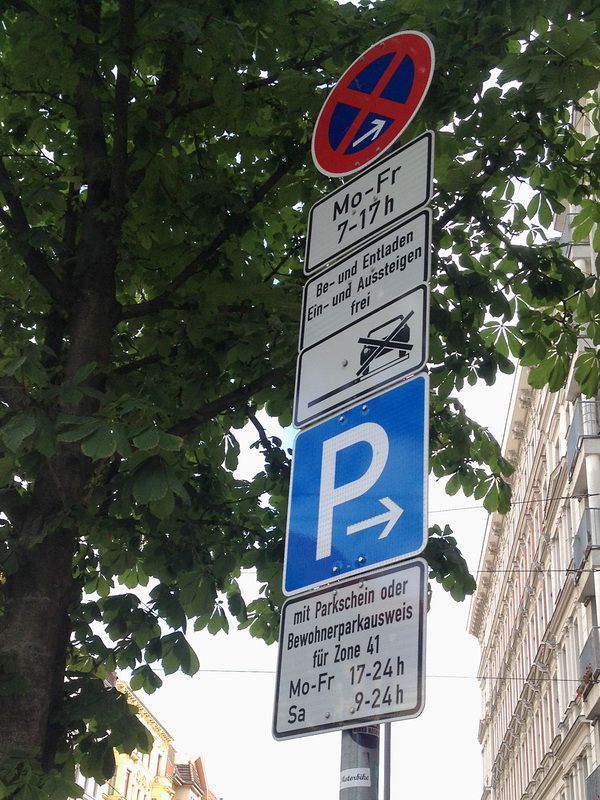 On this page I will try to explain the meaning of the different signs attached to typical German parking signs you will find all across Germany – and all over Berlin. First and most importantly a red circle on blue ground with either one or two red bars crossing the circle means No Parking. The little white arrow pointing towards “this” direction (the photo is taken from the spot that the sign is valid for) means the sign applies to this direction. The two red bars would not only mean “no parking” but actually also include “no stopping”. So you normally wouldn’t even be allowed to stop, for example to let somebody get in or get off your car. The fourth sign refers to the actual parking position: a.f.a.i.k. this crossed out car on a ‘white street’ means that the No Parking refers to the parking bay next to the street. I’m actually not 100% sure about this, but in this context that would be the only thing that made sense. The white P on blue ground is probably well know indication for “parking area”. So outside the above mentioned hours this is actually a legal parking lot. So for example after 5pm you could park your car here – but don’t forget to move it before 7am next morning – at least on weekdays. 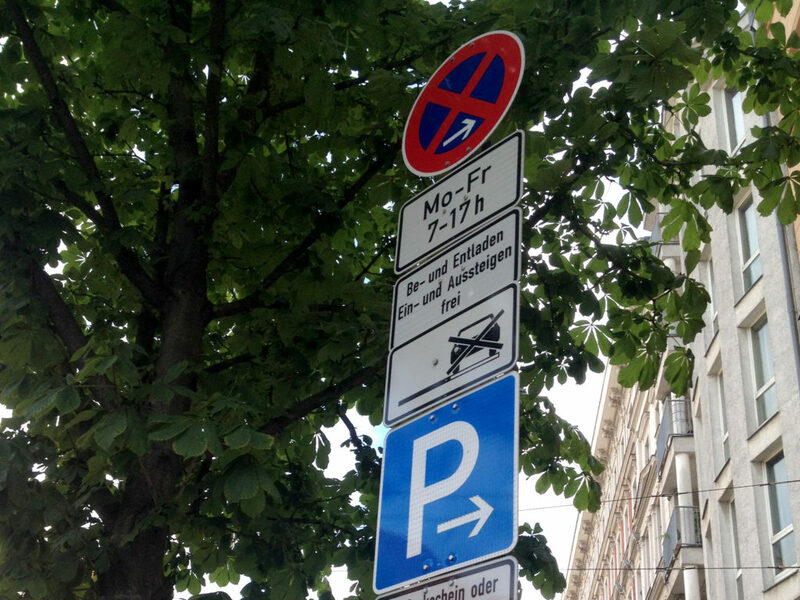 from Monday till Friday between 5 pm and midnight and on Saturdays between 9 am and midnight you will either have to purchase a parking ticket (“Parkschein”) or have a “Residents’ Parking Ticket for zone 41” (Bewohnerparkausweis) visible / on display. On the other hand this means: From Midnight till 7 a.m. it’s free to park here – and on Sundays you can park here without a ticket until Monday morning 7.am. Greatness. > How to use a Berlin parking ticket vending machine.